The IMPAC Award shortlistÂ was announcedÂ today. The IMPAC sets itself apart with its unique approach. ItsÂ massive longlistÂ is compiled by libraries all over the world before being whittled down by judges. This makes for a more egalitarian selection. Itâ€™s also got a long lead time. Several books up for the current prize (to be named in June) were initially published as far back as 2013, putting the IMPAC more than a year behind other big literary awards. Thereâ€™s a distinct upside in this. By now, nearly all the shortlisted books are available in paperback in the U.S. The Millions : The 2015 IMPAC Shortlist Delivers 10 Eclectic Titles. 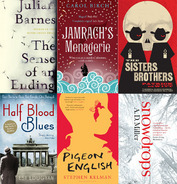 The Man Booker Prize for Fiction 2011 shortlist was announced on Tuesday 6th September 2011. Afsaneh Moqadam – Death to the Dictator!